Whether you are a biotechnology professional or an employer, it's vital to keep learning to stay at the top of your game. Continuous learning helps you fast-track your career, upgrade your global marketability, stay current on the latest advancement of biotechnology, and inspire professional confidence. 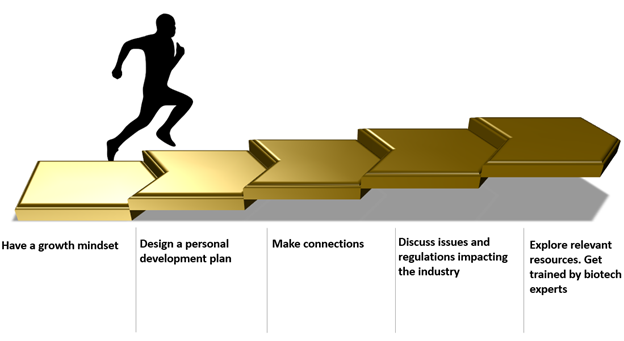 While guiding you through the steps to professional development, this article provides the key information you need to know in the biotechnology regulatory landscape to help you create a personal learning plan. Life science companies are rethinking and recalibrating their strategies based on the key regulatory compliance trends in the industry. For example, consider the following trend that is identified in Deloitte's Global life sciences report. 'In 2019, the life sciences sector will see a strategic rise of the digital mindset and further adoption of transformative technologies'. How should such strategic transformations of life science companies affect you as a biotech professional? To stay at the top of the game, you need to keep pace with the rapid changes, new regulations and current requirements. It is vital for you to "think forward" and cultivate a growth mindset. You need to have a learning plan. Your current skills - Do you have the skills that are sufficient for your current role? Do they align with the organizationb's priorities, vision and mission? Your past skills - Are there skills that helped you in the past and can be put to use in your current role? Are there skills that need to be sharpened or updated? Your future skills - What skills will you grow your career? What would your employer, customer, colleague or supplier want you to be good at? What measurement metrics will you tell you when you are successful? By what target date, timeline will you learn? Proactively seek professional development by subscribing to appropriate publications, online training, and weekend study programs, through your employer, or a professional training body. Join forums and network with industry professionals. LinkedIn Groups for Biotechnology professionals - medical device, drug manufacturing etc. Discuss issues and regulations impacting your industry in your network. Recommend solutions, generate user ideas, thoughts and feedback. Showcase your applied knowledge and skills through thought-leadership content and perspectives. Let the networking be a give and take process. Check with your manager if you can get help with on-the-job formal training without compromising on your current day to day responsibilities. The Biotech Regulatory Compliance Training - Live Webinars, Recordings & CDs are a great source. Every year, hundreds of Biotechnology professionals receive quality instruction from the best experts in biotechnology by using complianceonline to advance their career. Areas covered include healthcare/pharmaceuticals, genetic engineering, bioinformatics, food innovations and more. Join them! You'll gain insight subjects like Testing and Validation , Documentation and IT , Contamination Control , Quality & Safety , Technologies and Processes , Blood and Blood Products, Tissue and Tissue Products, Cellular and Gene Therapy , Biologics and Biosimilars , Regulations & Guidances. Below is information you need to know with regard to the biotechnology regulatory landscape. 3 Agencies work together to ensure regulatory compliance to let us use to safely use the benefits of biotech. The regulations also help in developing and using biotech products and services. 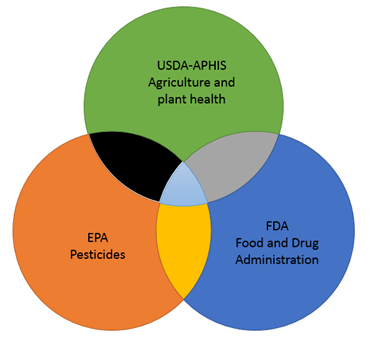 Regulations apply to the production, sale, and use of biotech products. This agency was created in the year 1862. Its purpose is to make agriculture safe to grow. The regulation of plant pests, plants and veterinary biologics is by this agency. Examples include any medical preparation made from living organisms or products such as insulin and vaccines. "Fast track" or "Notification" process. This agency was established in the year 1970. Its mission is to protect human health and the environment. To accomplish its mission, the agency develops and enforces regulations, provide grants, studies environmental issues to solve them, work with sponsor organizations to protect the environment, teach people about the environment, and publishes information through written materials on the website. This agency consults with companies to produce safe products. If food or additive poses no predictable threat, it is given a status known as generally-recognized-as-safe (GRAS). To perform your job well and grow professionally you need to read the regulations pertaining to your job roles or specific area periodically even if you have read it before. To find a relevant training program, click here.